Happy 40th birthday, Intel 4004! On November 15, 1971, 40 years ago this Tuesday, an advertisment appeared in Electronic News for a new kind of chip – one that could perform different operations by obeying instructions given to it. 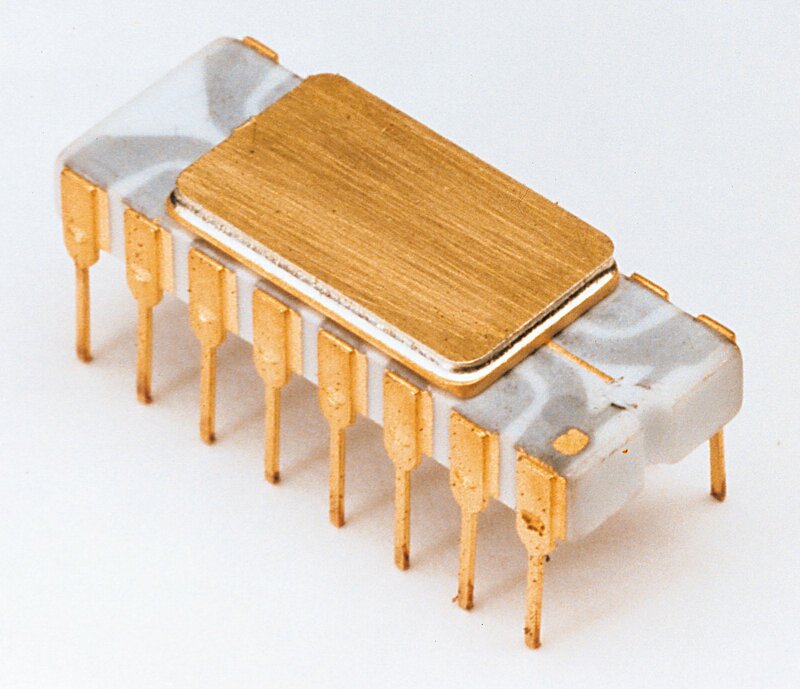 That first microprocessor was the Intel 4004, a 4-bit chip developed in 1970 by Intel engineers Federico Faggin, Ted Hoff, and Stanley Mazor in cooperation with the Japanese company Busicom (née the Nippon Calculating Machine Corporation) for that company's adding machines. 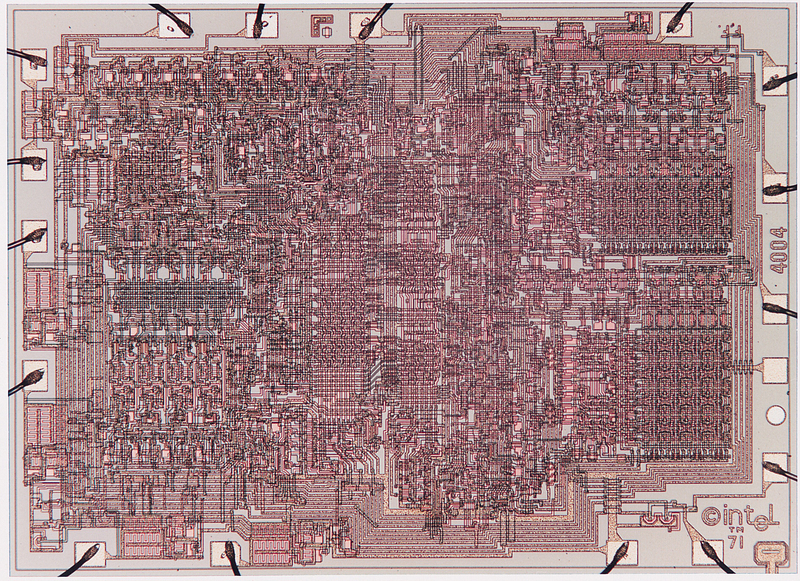 Busicom held the rights to the 4004 in 1970, but released them to Intel in 1971. Intel then offered the world's first processor for sale, and 40 years later that world is a very, very different place. At the time, only the most far-thinking futurists could have imagined the 4004's impact. For starters, the chip itself wasn't all that impressive. It ran at 740KHz, had around 2,300 transistors that communicated with their surroundings through a grand total of 16 pins, and was built using a 10-micron process. Exactly how far have we come in process technology since the 4004? Well, as your Reg reporter once calculated, if the width of a Intel 2nd Generation Core CPU's 32-nanometer process were expanded so that it could be spanned by an unsharpened No. 2 Ticonderoga pencil, the 4004's 10-micron (10,000nm) process, equally expanded, would be wide enough to fit an 18-wheeler followed by a half-dozen 1962 Cadillac Eldorados and a Smart Car. To say that microprocessors have changed radically over the past 40 years is to utter an empty truism. What's far more interesting is to take a look at the way in which those changes have evolved: the problems encountered, the decisions made, the discoveries ... well ... discovered. And so to review Intel's 40-year journey from the 4004 to today, The Reg contacted two Intel Senior Fellows who have been responsible for a good chunk of how their company's offerings have grown from the 2,300-transistor 4004 to the over-two-billion-transistor 2nd Generation Intel Core i7-3960X released Monday morning. We spoke with Steve Pawlowski, who has been intimately involved with a good portion of Intel's microarchitectural development since the early days, and Mark Bohr, who heads up Intel's process architecture and integration efforts. We learned a lot, such as the fact that for the first 30 years or so, there really weren't all that many challenges in process development. "Most people would say that the period from 1971 until the early 1990s – actually, even to the end of the 1990s – that 30-year period was really the golden era of traditional, classic transistor scaling," Bohr told us. In those days, the materials used in processors hardly changed – it was based on silicon dioxide for the gate insulator, or dielectric, and doped polysilicon for the gate electrode. "We were simply scaling," Bohr said, and with that scaling came reductions in power needs, and continual improvements in transistor densities and performance.